CaterSeal | Save Time. Save Money. Revolutionizing the culinary world one kitchen at a time. CaterSeal is a new patented device that makes a fantastic accessory to any kitchen, large or small. 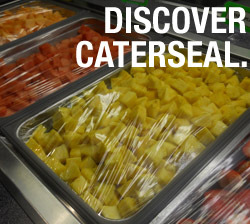 From a local mom-and-pop restaurant to the bustling industrial kitchens of schools, hospitals, military bases and more, CaterSeals are guaranteed to increase efficiency and food preservation, no matter the size of the kitchen. CaterSeals also improves food presentation with two colors. From gray and a sleek black, CaterSeal allows you to enhance the presentation of your food and allow consistency in your business's branding efforts.